Our range of products include solvent filtration kit. 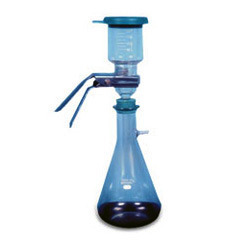 Being a quality centric organization we are dedicatedly engaged in offering our valuable clients a vast assortment of Filtration Kit, Solvent Filtration Kit, and Inline Filter Holder. Our given product is high on demand due to its superior quality & performance. This product is developed by using finest quality of material & modern technology in accordance with the industry norms. In addition, this product is obtainable in several specifications as per the varied requirements of the customers. liter flask, 250ml vessel filter holder clamp. Suitable for 13mm dia filter. Supporting SS mesh & 0 rings included.